Sarah Lomax and Rachel Skinner have been making hats for over 20 years since serving their apprenticeships together with Frederick Fox, the Queen’s milliner. Their Lewes based bespoke millinery continues to thrive, and the recent publication of their beautiful book, published by GMC is a fitting milestone in their careers. Here, Tara Gould talks to them about their love of hats. 1. Can you tell me a bit about your story, what drew you to millinery? We both always loved sewing as children. My (Rachel's) first hat inspiration came from my first ever lesson in millinery whilst studying fashion at the London College of Fashion. I like to work in 3D creating shapes on a mannequin head (called a poupee) like sculpture, combined with beautiful fabrics and hand sewing its the perfect combination. A friend of Sarah’s recently reminded her that even at school she said she wanted a career in hats! Sarah went onto Art College and even before it had finished she was knocking on the doors of esteemed London milliners asking for a job, one of which she got - possibly through her unconventional approach! 2. How did you meet one another and what made you join forces as an expert bespoke hat making duo? Sarah and I met over 20 years ago whilst learning our trade working to the highest standards in the workshop of Frederick Fox, the Queen’s milliner. 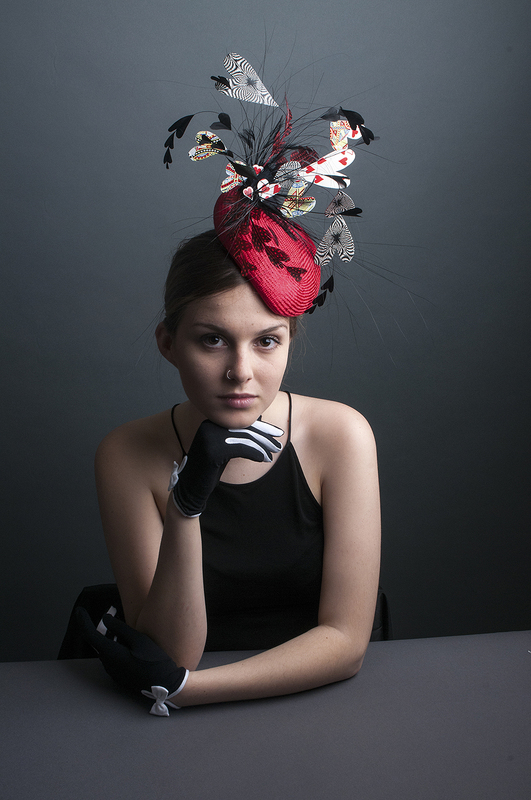 We received expert one on one tuition from highly skilled milliners for three years before moving on, gaining more experience working for other milliners such as Stephen Jones. We feel privileged to have learnt the skills, techniques and attention to detail necessary for couture millinery that very few student milliners are now being taught. We came together in the last 5 years to set up Lomax & Skinner. It's great working together as we know each other so well and both bring different skills to the business. Sarah is brilliant at making very intricate things like flowers, hand beading and embroidery. I like to work on a bigger scale forming shapes in a much freer way. Sarah is an excellent technician and teacher which are essential skills for working out how each hat will be made and for running our courses, throughout the year from our Lewes studio. Our new book published by GMC is about sharing our love and knowledge of millinery. With over 50 years experience between us both we wanted to pass on some of the skills and traditional techniques we’ve gathered. Not everyone has access to attending a course so this book comprises of 12 eye-catching contemporary designs all fully illustrated with step-by-step instructions and colour photography. There are sections on equipment, materials and techniques. We have kept the equipment minimal with many of the projects being made with household items. Some projects are for the complete beginner whilst others will attract the more experienced milliner. You will learn how to achieve high-end couture results at home. 3. What is it that makes Lomax and Skinner distinct? Attention to detail, quality of materials and craftsmanship are distinct qualities of our work. We pride ourselves on spending a lot of time and thought at the design stage getting the balance of shape and the space left around just perfect. We use ethical and local suppliers as much as possible, all of our hats and headpieces are 100% made by hand in our Lewes studio. Lomax and Skinner is a totally independent brand with just Sarah and myself (Rachel) behind the scenes designing and making (as well as keeping on-top of the day to day running of a small business!). We produce a collection every year as a starting point for our customers but each hat that leaves our studio is as unique to the individual, in terms of materials that have been used, size, shape, colour and trim, as their personality and the special occasion are. 4. What part of the process do you particularly enjoy and is there a special tool you like to use? We love so many of the techniques used in millinery. From the blocking of the foundation materials to the trimming and finishing. We particularly love the wooden forms and the many beautiful shapes and sizes that hat blocks come in which can be collectors pieces in themselves. Its so satisfying ‘blocking’ material over the hat blocks to start the shape of a hat. Lots of steam is use, mixed with some elbow grease, a thimble and lots of pins to create the shape! 5. What is your favourite type of hat, or a hat you have made that particularly stands out. We don't have just one favourite hat, we both have many! One hat that particularly stands out is White Rabbit, a quirky piece Sarah designed when we were artists in residence at The Churchill Hotel for an exhibition about Alice in Wonderland. The mix of the purest white feathers with the silkiest pale blush duchesse satin is exquisitely elegant. 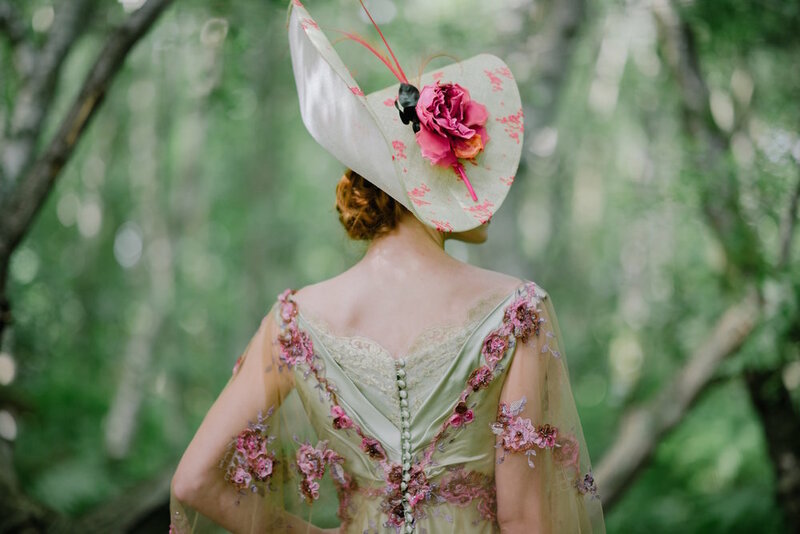 If you're interested in learning millinery techniques with the masters, Lomax & Skinner will be running their exclusive one day workshop in the A.S.APOTHECARY shop in November, using jewel coloured silk velvets and organzas to make a beautiful flower corsage. To book or find out more click here.